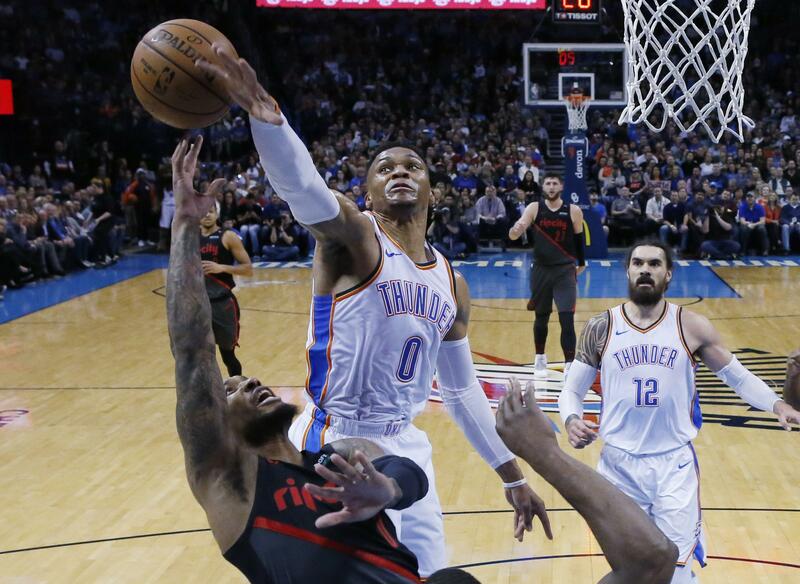 Mon., Feb. 11, 2019, 8:47 p.m.
Russell Westbrook set an NBA record with his 10th straight triple-double, Paul George scored 47 points, and the Oklahoma City Thunder beat the Portland Trail Blazers 120-111 on Monday night in Oklahoma City. Rockets 120, Mavericks 104: In Houston, James Harden scored 31 points for his 30th straight 30-point game despite dealing with a shoulder injury, leading Houston over Dallas. Cavaliers 107, Knicks 104: In Cleveland, Collin Sexton scored 20 points and Cleveland held off a late rally and sent New York to its franchise-record 17th straight loss. Nance and Jordan Clarkson each scored 15 points. Kevin Love had 14 points and nine rebounds in his second game since returning from foot surgery. Raptors 127, Nets 125: In Toronto, Kawhi Leonard banked home the tiebreaking basket with 4.2 seconds remaining and Toronto edged Brooklyn. Raptors center Marc Gasol scored 16 points, 11 in the fourth quarter, in his home debut after being acquired in last Thursday’s trade with Memphis. Bucks 112, Bulls 99: In Chicago, Giannis Antetokounmpo scored 29 points and had 17 rebounds, Eric Bledsoe added 19 points and Milwaukee outlasted pesky Chicago. Nuggets 103, Heat 87: In Denver, the Nuggets snapped a three-game skid by beating Miami behind 23 points and 12 rebounds from Nikola Jokic and 20 points from Malik Beasley. Pistons 121, Wizards 112: In Detroit, Andre Drummond had 32 points and 17 rebounds, and Detroit extended its winning streak to four with a victory over Washington. Pacers 99, Hornets 90: In Indianapolis, Myles Turner scored 16 points and Thaddeus Young added 11 points and eight rebounds to help Indiana hold on to beat Charlotte. The Pacers have won six straight – all without two-time All-Star guard Victor Oladipo, who will miss the rest of the season with an injured right knee. Timberwolves 130, Clippers 120: In Minnepolis, Derrick Rose and Jeff Teague gave a beleaguered backcourt a needed boost and lifted Minnesota over Los Angeles. Published: Feb. 11, 2019, 8:47 p.m.